Who’ll Get Hit by Fallout from the $11-Trillion Commercial Property Bubble in the US? It’s the banks they’re worried about. Warnings about the loans, bonds, and commercial-mortgage-backed securities (CMBS) tied to the vast $11-trillion commercial property sector in the US have been hailing down for months. Moody’s Investor Services just warned about the rising delinquency rate of some $360 billion in CMBS it rates. Delinquencies of 60+ days jumped from 4.6% last year to 5.6% in September. Fitch Ratings has been fretting about valuations in the sector, and CMBS, for months. “Valuation and lending trends are not sustainable in the medium term,” it said most recently in its November report. It pinpointed debt backed by apartment buildings as a particular trouble spot. But now it’s also fretting about construction loans, which “experienced the highest loss severity in the last crisis, and we expect a similar trend in the next downturn,” it said. All of the most concentrated banks – those with more than 300% of risk-based capital in CRE – have less than $50 billion in assets and most have assets below $10 billion. These smaller banks also have varying degrees of sophistication in their risk management practices. Alas, since the report was released on Election Day, interest rates have alread jumped. 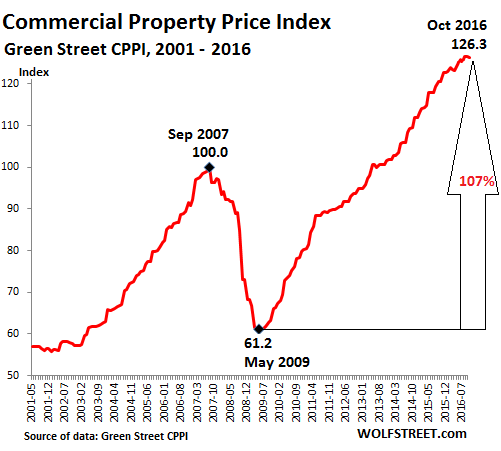 This comes at the worst possible moment, at the peak of the most gigantic CRE price bubble the US has ever seen. But it may have run out of steam. The index edged down in October, has been uncharacteristically flat for the past three months, and is up only 4.7% for the year – after annual increases that were often in the double digits. Of the index components, on average across the major markets, lodging has plunged 12% year-over-year, and the prices of health care buildings are down 1% year-over-year. Apartment building prices are down 1% for the past three months, but are still up 5% year-over-year. Self-storage was flat last month, but is still up 14% year-over-year. It’s up 80% from the peak of the prior bubble in 2007! Industrial, mall, office, and strip retail properties were all flat last month but year-over-year still rose between 3% and 7%. In some of the top rental markets, rents have come under severe pressure, including San Francisco, New York, and Boston. Building prices are trailing behind. As buyers have suddenly lost their enthusiasm, commercial property sales volume dropped 8.6% in the first nine months this year to $345.4 billion, according to Real Capital Analytics, cited by the Wall Street Journal. “I can paint a picture that it could be disastrous, with runaway inflation and high interest rates,” said Charlie Bendit, co-chief executive of Taconic Investment Partners, at a New York industry luncheon last week, according to the Journal. Part of the problem in the current cycle are CMBS that were originated before the Financial Crisis in 2006 and 2007 and that are backed by ten-year loans that are now coming due. Fitch calls it “the wall of maturing loans.” $205 billion of these maturing CMBS are rated by Fitch. Now the loans need to be refinanced. And that may be tough. In all, Morningstar Credit Ratings LLC predicts borrowers won’t be able to pay off roughly 40% of the commercial mortgage-backed securities loans coming due next year. Suburban office properties and shopping centers are being hit particularly hard, said Edward Dittmer, a Morningstar vice president. “We’re seeing a lot of stress,” Mr. Dittmer said. Consider the Skyline office complex in Fairfax, Va. Vornado Realty Trust financed the property in 2007 with a $678 million mortgage that was converted into bonds [CMBS]. Vornado was forced to restructure the loan in 2012 after the portfolio ran into trouble. Earlier this year, Vornado for a second time notified the loan servicer that “cash flow will be insufficient to service the debt,” according to a regulatory filing. A Vornado spokesman declined to comment. The problem is being muddled up further by a Dodd-Frank rule that will take effect on December 24. It requires issuers of mortgage-backed securities to retain at least 5% of the securities they create – their skin in the game, to discourage the type of risk-taking and abuses common before the Financial Crisis. This “risk retention rule” will make it more difficult to refinance these loans and repackage them into CMBS. Fitch expects that banks, insurance companies, and “other market participants” (hedge funds, PE firms, and the like) will refinance “many of these loans.” If banks refinance them, it will further increase their exposure to CRE, which would likely be a “credit negative,” Fitch said. But if only “many of these loans” get refinanced, what happens to the remainder? “You couldn’t have planned worse timing,” explained Tad Philipp, director of commercial real-estate research at Moody’s, about the refinancing debacle, after the bubble has peaked, with new rules in place, at a time of possibly sharply rising interest rates. To top it off, vacancy rates are now rising, and in many places rents are heading south, making for another perfect storm in post-bubble commercial real estate. We rinsed and are now ready to repeat. In the final accounting the same marks that always foot the bill, namely the taxpayers and other innocent by-standers, will pay for the implosion of this bubble. Given the above, what is the best short ? The real estate debacle triggered a collapse in more than just national house prices. Something that was always said to be local became global after Paulson stole the check? The 5% takedown probably gets financial engineering at a much higher rate than market and the earth shattering kaboom forces the fed to buy the bad paper? I believe that long dated paper continues to disappear as pension funds give up on the opportunity to hold it? Long any financial that control myIRA accounts? Short shadow banking in any form! KRC, VNO, BXP, and SLG are good targets for CRE shorts. A lot of their exposure is in states like New York, New Jersey, California, and Washinton. The have a lot of exposure to San Francisco, Washington DC, Boston, Seattle, Los Angeles, Manhattan, Brooklyn, etc. You can short ordinary peoples bank accounts. You did not think banks will be allowed to fail, did you? The fed needs to sell off the balance sheet full of IOU’s back to the banking system without speards blowing out? Annuity companies already can’t function due to duration risk and the Fed is loaded with long duration/micro-spread product? The Fed would have to engineer a kind of reverse split and eliminate said counterparty risk both foreign and domestic? The Fed stopped QE and has since raised rates. they are pulling money out by paying interest on deposits which may answer your question twice? There are too many liabilities sitting in too many bank accounts? SRS is an commercial real estate short ETF. It’s a double inverse…but is starting to tick up. None of this has made any sense for a really long time. Wages flat and with rising mandatory insurances, taxes, fees and food prices I have watched the new commercial spaces build out in Oregon with amazement. I guess if you are a carpenter with a hammer, everything looks like a nail. Investors have to invest or they have nothing to do. It just all seems totally insane to me. We need more than a wash this time. We need to pressure wash the entire system and clean out all this insane debt backed by some poor souls either buying or spending who has no disposable income to buy or spend with. Poor Donald is going to be very unhappy when all his plans to make himself and his kids really really wealthy ends up bankrupt with all the rest. He may have to take that $400k salary just to have something to live on. That’s what I never got. DJT said he was gonna make a big profit off running for the Presidency. That will be his first and foremost goal. And if I know rich people in corrupt times, they grab theirs and get out the back door first. He will be the First Looter, and maybe the last…. Only hope is that he is brave enough to face the Great American bankruptcy. LBJ resigned and his out his days on the ranch rather than face. Nixon bought us a few more decades by getting the Chinese to buy our bonds in exchange for our industrial base. It would be a great accomplishment if he can negotiate that. Maybe giving the Chinese a couple of those nuclear-tipped aircraft carriers would fend our creditors off. DJT, Looter in Chief ? I see this being about ego, and his humiliation by the Big O, during the correspondents’ dinner in 2011 or 2012. Having made his billion or billions, I just see no evidence of his wanting to LOOT as President. So what is the evidence for the assertion that his goal is to LOOT the USA when he Presides as Commander in Chief and also as Emperor of Executive Actions ( a la Obama ) ? When you’re a billionaire with Mansions and Towers that have your name, and a really Yuge plane and nifty Helicopter, the only remaining thing ( to my thousandaire mind ) is Ego Aggrandizement . As always, I could be wrong, but I am definitely curious about the evidence for LOOTing by DJT. i don’t know what the heck is going on with the whole Trump debacle. I’d rather have him in the WH than Hillary but i wouldn’t have voted for him. All that being said, I keep getting people saying stuff about the guy that is full of half truths and outright lies. I had this discussion on Saturday night and told the person “pull up the links to the videos or article that have the quotes or STFU”…….they proceeded to spend almost an hour on their phone to “show” me how racist, sexist, bla bla bla the guy was…….and came up empty. the MSM has done such a miss information campaign i think they should be brought up on charges and and it continues to this day. In the 60 minutes piece he was still supposed to defend himself for inciting violence when the reality is that, now and all thru the campaign, the vast majority of the violence WAS FROM THOSE OPPOSED TO HIM. it’s like reality isn’t even part of the discussion any longer. In defense of the Captain, it’s DJT’s brother at their ‘Church of the Stripper Bandits’ who is his most influential fellow and a well known looter. Wilbur Ross Jr. of Rothschild Inc. fame, the front man who bailed Donald out back in the late eighties, early nineties. Famous for looting coal miners and the steelers, taking everything he could as they died in the unsafe mines and mills. Is DJT not right now facing a fraud trial? He’s got a long list of lawsuit defendants, investors, casino employees, construction employees and contractors who lost everything. It’s very simple, why DJT ran, the economy became so dysfunctional that even billionaires couldn’t make money anymore. His promise to roll back regulation and taxes was a big attraction to both the rich and middle class business owner. No. The people wanted an FDR! Franklin Delano Roosevelt! The people had one too, he was drawing truly enormous crowds. Springfield, MO campaign stop was unbelievably huge! If I weren’t just too tired, I’d really debate. Just put away 100 lbs of tender all natural venison, wrapped up in the deep freezer. From our own land! Superstar says if it were all natural say, beef, the price tag would be a couple thousand dollars or more. At least couple hundred dollars of trimmings saved for the gray fox, too. Speaking of Billionaire excess . . . . I liked reading that, and recalling it happifies me ! I also have enough . Wanting more is a path to frustration, and also to dying without enough. All billionaires suffer from the malady of always wanting more, I suspect. That last paragraph is like pure money! Trump and his builder buds sticking $100 cigars up yellens privates. Everybody gets smoke for x-mas and a mandatory lump of coal and diamond making instructions? Since someone else has brought up Trump…. The transition team needs a transition team. Seriously, we could be in trouble with this gang. However is appointed to cabinet, we now know there will be a privy council of family members and camp followers. It looks like the power behind the throne is going to be the kid-in-law. But is Ivanka the power behind him? She is certainly his link to power- let’s hope for his sake he doesn’t take Trump as an example of fidelity. The kid hates Chris Christie because Christie put his dad behind bars for tax evasion etc. ten years ago. Fine, and Christie was damaged goods anyway. But the kid wanted all Christie’s hires fired too including Rogers who as sort of normal stuck out in this line- up like a giraffe in a herd of cows. He could have been a private adviser with one of the 4000 jobs. ‘I want to be everyone’s President’ ….and then he does the exact opposite. I’d love to know what Kellyanne thinks about this, she isn’t THAT stupid. A positive note; stand up comedians can not only breathe a sigh of relief, they can maybe think about starting a family. The liberals will find a reason to oppose any and all his appointments. It really doesn’t matter who he picks because the dems will not be appeased. As a college educated Latina who voted for Trump, I am labeled a racists, misogynist, uninformed, and well the list is too long to remember. They can’t do anything about Bannon- chief strategist is not a cabinet position. Ditto Kushner although he may closely related enough that he can’t receive a salaried position. Like that will be a problem. The point is that the real cabinet, the persons most closely influencing the President, won’t be cabinet members. Bannon and Kushner don’t even have to be interviewed let alone confirmed. same with his children, and they may or may not even be appointees.. but will have top security clearances and be apart of what DJT does.. So much for a blind trust. Lots of intrigue and conflicts of interest in this new administration so far. Its the majority parties responsibility to babysit trump! Over here in the Dutch housing bubble paradise the national TV news propaganda channel cried foul yesterday about the ‘huge’ rise in rates, from about 1% tot 1.1% for a 10-year fixed 103% mortgage (possibly the most common mortgage over here). Keep in mind that the effective rate is half of that, around 0.5%, because of Dutch mortgage tax deduction. Very unfair, and all Trumps’ fault!! (over here in the EU, the TV news was and is even more biased pro-Clinton than in the US). Fortunately, our housing market is extremely strong so no need to worry, run to your realtor and take advantage of the low rates as long as they last and buy another house! Also, higher rates means that the feared reductions in pensions probably will not happen, so that’s great (and not thanks to Trump obviously, but thanks to the clever pension fund managers and politicians). More spending power for our wealthy boomers, so they can gobble up even more investment properties!! You need to study up on difference between real and published rates? Before you do this however you might take a moment to realize ” rates have never been remotely close to current quotes and everyone will feel priced out immediately if they back up even marginally? The 99% who have never seen rates rise EVER should be warned ” central banks carry huge balance sheets and the bond vigilantes smell those bonds like foxes smell hen houses”? those (below-)1% rates are real, just not for the US (I’m talking about the Netherlands, most of North-West Europe is probably similar). They might be slightly higher for those with severely compromised credit score, but not much. The main reason is that all mortgages up to 275K euro are fully insured against loss by the government (the taxpayer), so providing a mortgage is considered risk-less by the financial industry even if the buyer is a financial deadbeat. I know how big the difference could be when rates revert, I had a 11.7% mortgage for a few years in the early nineties ;-) In those days you needed a downpayment of at least 20% (maybe 10% with stellar credit score) and all applications were scrutinized, in the current situation with zero-down and the biggest mortgage one can get the norm, all recent buyers will be under water right away when rates start going up. For a moment I could see the Maas! I keep saying this as well and have been wrong wrong wrong. As it stands RE prices would have to fall to 25% of current prices for me to even come close to being able to afford a home. It’s almost to the point where i can not afford to live in the United states. Yes, the madness has continued in most Western countries for much longer than almost any sane person imagined. The Dutch RE market was ripe for an epic crash around 2000 (after 10 years of double-digit price gains, and cumulative gains of around 1000% while wages increased maybe 50%). But the market kept rising with some hiccups along the way, because politics threw everything plus the kitchen sink at the RE market and prices are now on average 100-200% higher again than around 2000. ECB’s NIRP/ZIRP policy is adding even more fuel to the fire. Currently, renting in the free market in Netherlands often requires 50% or more of ones salary. Buying is MUCH cheaper on a monthly basis, but you have to buy an extremely overpriced home to start with. No good options except emigrating. I guess in the Netherlands, houses are the new tulips. History doesn’t repeat, but it sure rhymes. If you can’t live in the US, you can’t live anywhere! You should see the costs, and taxes, to live overseas in a comparable society! You wonder how they survive … even the difference between Canada and the States is huge – food, taxes, house prices, gasoline, everything is significantly higher. But not health care- for millions of Americans becoming seriously ill means serious financial illness or even bankruptcy. nick kelly, ‘free’ healthcare in Canada costs 500 dollars a month per person, paid by taxes and debt. So, for a family of four, 24,000 dollars a year. It’s hidden, but it can’t be hidden forever, and it’s beginning to show up in the rationing and waiting lists, because the system is just at the maturing stage. I’m not saying it’s bad or good, it’s just the way it is. Infinite demand on finite resources. I certainly wouldn’t want to endure Obamacare, which has hardly started but requires people to pay exorbitant premiums with deductibles in the thousands, and with providers withdrawing because they’d go broke under the plan. It’s hardly started, but it’s already collapsing. Frederick, I’m talking about living costs and comparable society = not 3rd World = amenities = civilization as experienced by 1st World dwellers, in ordinary places, not downtown Manhattan. Everything is more expensive overseas, and dramatically so, from taxes to gasoline to autos, to food, to you-name-it. They better be fast if they want to blame it on Trump. The empty bangs would not understand rising LIBOR, and bond yields, nor that they have been living in an artificial nirvana in at least the past eight years. What’s the waiting list for subsidized/public housing in Netherlands? In Sweden it’s from a few years to over 20 years or more in the cities. The only hope you have is to get a sublet (but there could be hundreds of applicants), officially at no higher than 115% of official rent and the lessor needs to have an acceptable reason for letting it, but the black market rules in terms of real pricing and ‘key money’. In practice you can’t get subsidized housing any longer here unless you are on the dole or in some ‘disadvantaged’ group (like single moms, divorced women, ethnic minorities, people coming from jail or with serious psychic problems etc). Officially people with less than median wage and little savings qualify for subsidized rentals, but there are many other restrictions and with median wage the subsidy is next to nothing so a decent home will still be expensive. But if you are on social security, you can chose any home you like for prices that are 3-4x lower than in the free market, and just 20-30 euros monthly difference between a crappy apartment and a beautiful town home with garden. As a result, the waiting lists have grown to over ten year in the more popular areas. People who once got their hands on subsidized housing (some of them now with high incomes) never want to leave, because their monthly costs would skyrocket. Lately it has gotten much worse because migrants have the highest priority for subsidized housing, which means that in most cities a normal Dutch citizen will now have to wait forever to get a subsidized rental home, unless the refugee stream stops completely. Subletting is an option, but completely illegal here. Many people on social security use tricks like divorcing on paper so they get an extra subsidized home (divorced women usually get a new home within weeks, although nowadays due to the migrants they may have to wait much longer). They pay rent of 250-300 euro per month and can easily rent the second home out for 800-1000 euro per month, or much more in the big cities. Some even move to some cheap vacation paradise and live the good life from social security and illegal subletting. There is rampant fraud with this, but the government doesn’t want to know. Officially they investigate any rental fraud case that is reported to them, but the first thing they do is let the fraudsters know who reported them to the authorities. With the huge amounts of money at stake, most people will remain silent… So the game continues, and politicians love it this way. P.S. : I should add that over 90% of rental homes in Netherlands is public housing (most of it owned by housing corporations and built long ago for very little money) and until recently most of that was subsidized or with artificially low rental fees. The ‘free’ (unsubsidized) rental market is less than 5% of the total market. About 55% of Dutch households ‘own’ their home and the others are renting. But politicians have been making big changes lately, trying to force most of the renters to become owners, in order to push up the housing bubble. Rents for public housing have increased hugely (like 5-10% every year) but only for those with median income or more and housing corporations have been trying to unload their homes to the renters using many bad incentives (25% discount from an artificially high valuation, zero-down mortgages at very low rate that will crash and burn when rates go up). Thanks for the info in this and your subsequent reply. It is frustrating to see government everywhere make the same mistakes forever. Who will get hit? ?…should I bend over now? I don’t know which 5% of the MBS’s Dodd Frank requires the issuers to stockpile. But I do know that in every pool there is at least 5% that is the cream and will be repaid. Want to take a guess which tranche will be retained. This rule is no big deal for the issuers. It sort of mandates that they keep the best part of the income stream. What a surprise. Between now and Jan.1 corporations and the Federal reserve will enter a liar loan situation last experienced during R.E. bubble? Corporations will be allowed (pressured) into issuing debt to take advantage of once n a lifetime opportunity to lock in? Regard less of ability to repay? Corporate issuance could go thru the roof and along with it LIBOR? Pressure on money stock continues to grow! And Donald’s children, will be first at the trough, to pick up all the shattered pieces for pennies, on the Hundred dollars. I don’t disagree with that, but if Hillary had won, her child would be queuing up the Clinton Foundation donors as well. It’s a corrupt system and it needs to be fixed. Its already taking longer for the pizza guy to get here! I remember when there was a HUT on every corner! I’m fascinated by the fixation that everything that happens is the work of a mysterious ‘they’ who plan all crashes. There is overwhelming evidence that real crashes, e.g,, 1929, pull down the ‘masters of the universe’ along with the small fry. In 29, after the first crash, bankers tried to stabilize the market with a well- publicized buying spree. Then it crashed further, eventually taking out most of them. Just one example: Richard Whitey was President of the New York Stock Exchange. In trying to support the stock of Distilled Liquors Corp as it fell relentlessly, he began posting the stock of other people as collateral. If it were the case that a malevolent ‘they’ caused these unwelcome corrections etc. the solution would be simple- we could liquidate them. Which has been tried quite a few times. But if the answer lies closer to home, with the desire to consume now and pay later, the solution is not as simple. There is 5 trillion IOUs on the fed balance sheet that must be discharged before we can do anything for ourselves? There were 1.5 million accounts on wall street in 1929 which was 1% of the population. Many got out before the crash than were still left and that is ” the rest of the story”. So that means only GOOD THINGS to come, amiright? History is plentiful with RE stories of boom and bust. This one is different though, or is it? A good friend of mine said recently – some people shouldn’t own houses, or shouldn’t be driving those fancy Audis and BMWs. In fact, he jokes that they shouldn’t even have a smart phone. He is so correct! Those people he talks about have part time jobs and can barely afford the interest on their credit cards. Yet – they have taken out loans of 400 to 600k just because the money is free AND……………………..RE always go …..UP. That’s what the realtors tell them. Here is the problem for most of these folks, they have never witnessed a RE bust. They were too young the last time around. I have the patience to wait it out. How can a condo in Toronto or the greater Toronto area (GTA) worth more than one in Florida? Its a bit slow coming, but when it does, the bust will be spectacular. I agree with everything except the comparison of TO with Florida. A significant portion of Florida is uninhabitable swamp- as some of the sight- unseen buyers in the Great Florida Land Bust found out in the 20’s. Toronto has been described by an American as New York run by the Swiss. Although such a dense urban environment is not to my taste- the city functions well compared to most US cities. And it isn’t full of guns. Toronto also has TCHC community housing, which requires its own police force, and which regularly shows up as the worst landlord in the city, with a backlog of repairs approaching 1 billion dollars, while tenants live in misery. Toronto is less violent, more tolerable of minorities and their housing market is tenfold more stable than our won – pretty easy to see why actually. I smell another sleight of hand bailout under ordinary circumstances but if they can’t keep their own sh_t show going by themselves and are forced to request another billionaire bailout or bust then hopefully Trump calls the bluff and makes them eat their gambling losses instead. Solar fell off the roof and broke it’s neck in after hours, what a huge scam. The smart big owners of commercial real estate have been selling for quite some time now, having cashed in on the boom for the last few years. With cap rates now at historical lows, when interest rates inevitably rise, these properties will be bought back at huge discounts – probably by the same guys. There is such a thing as a business cycle, no matter how much people pretend there isn’t. On the other hand, at the market top local government will eagerly buy trophy properties (usually historic/monumental buildings) from private citizens who cannot find a buyer at their ridiculous asking price. Of course government always overpays even if they have no need for extra real estate. Often they buy back the same properties that they disposed of after the last crash, selling to well-connected citizens at far below the already low crash valuations. One trick they use is that government property is often sold with sealed bids where politicians decide what bid is the most “appropriate”; hint: it’s never about best price, usually the property goes to the lowest bidder because they promised to do something politically correct with it, like renting it out to some disadvantaged person or group, NGO etc. – which happens for maybe a year and after that it’s just raking in the money. When government buys, it’s the same in reverse. This year my local government needed many new properties for housing “refugees”, in addition to a huge, completely renovated refugee center. In such a case they always buy the most overpriced properties they can find because those are “readily available”, usually from well-connected sellers. Of course these properties are fully trashed in a few years and the neighborhood gets to enjoy the fun of entitled refugees who have nothing better to do all day than drinking beer, chasing women and spending money on new stuff. After a few years the buildings need full renovation after which the government again sells to some private person for a fraction of their original cost. um, prices seem about twice what i can pay.